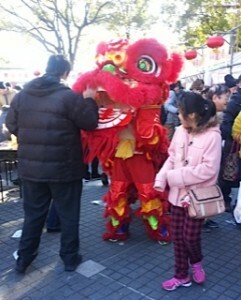 名古屋市昭和区の英会話スクールBigBowEnglishLab > ブログ > Happy Chinese New Year! 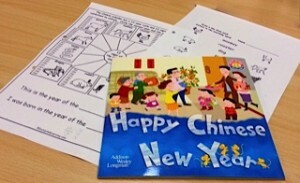 Winter is not my favorite season, but I always look forward to teaching my students about Chinese New Year. The children love to compare and contrast it Japanese New Year. For example, during both holidays children receive money in envelopes but while the ones in Japan are often decorated with cartoon characters, the Chinese ones are always red since red is a lucky color. Another point they discovered is while both Japan and China use the Chinese zodiac, some of the animals are different. This year is the Year of the Sheep in Japan, but in China it’s the Year of the Goat. They also really enjoyed watching a short You Tube video of the lion dance. After a week of doing this lesson in some of my classes, I was delighted to find out from a friend on Facebook that there was a Chinese New Year festival in Sakae! I went on Sunday and ate lots of delicious dumplings and noodles I bought at different food stalls. After I finished eating, there was a lion dance performance on the stage. It was incredibly noisy but exciting to watch. The lions ran off the stage and into the crowd, so I jumped up and took a photograph. Nagoya doesn’t have a Chinatown like Yokohama or Kobe, so I was very pleased that after teaching this lesson for many years, I finally got to experience a Chinese New Year’s festival!